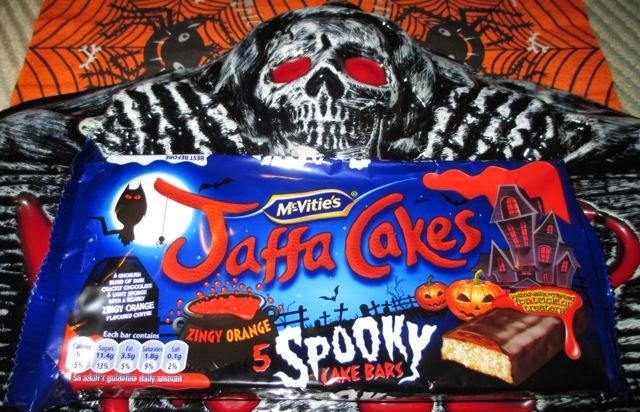 I think the thing that strikes me most about this Halloween edition of Jaffa Cake Cake Bars is that despite being orange flavoured, they managed not to include the phrase ‘blood orange’ anywhere in the marketing or packaging. I’d have put that down to an easy win on the Halloween theme. The orange in the cake bars is a meagre ‘zingy orange’. The wrapper is nicely decorated though, and specially put together for the season complete with pumpkins, a cauldron and even a spooky house. 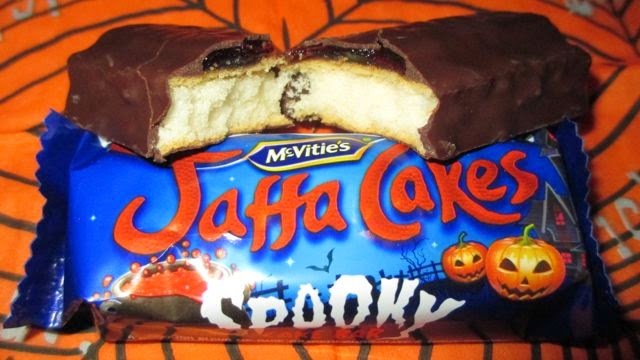 The cake bars inside the packet are individually wrapped, so they are good for handing out to Trick or Treaters, but as there are only five they won’t last too long that way. Last year we had so many knocks at the door that I thought I was going to have start offering out items from the fruit bowl as an emergency! The cake bars come with a dark chocolate coating on top of a vanilla sponge, with a layer of ‘zingy’ jaffa orange. I was a bit disappointed that the ‘zingy’ orange didn’t look quite as blood red as the image on the packet had hinted out. The flavour was good though, the orange has a tangy sharpness, and the darkness of the coating was a nice contrast. The sponge was fluffy and light, and these are very easy to eat. I think the cake bars are a bit nice for Trick or Treaters so I’d recommend saving them to the end and trying to keep them for yourselves… unless it is between giving these away or a small branch of seedless grapes, but I guess that also depends on how good your relationship with the neighbours is!